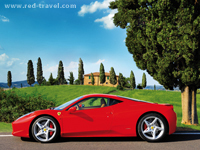 Red Travel offers tailor-made Ferrari Tours all over Italy. 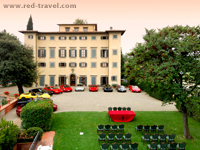 Individual Ferrari Tours or company Incentives can be organized throughout the year in Tuscany, Toscana, Rome, Florence, Firenze, Milan, or other locations on Lake Como, Lake Maggiore, Lake Garda, as well as Venice and Naples. Breathtaking scenery, wonderful food, and people with an infectious passion for life, it's hard to imagine a country with more to offer. Red Travel does not rent you a Ferrari for your trip of Italy. It lets you experience Italy by Ferrari as a First Class traveller. Staying in the very finest hotels, eating at Italy's most famous restaurants, and assisted by a staff of highly qualified professionals. This 1- to 8-day tour can be tailored to suit your every need. 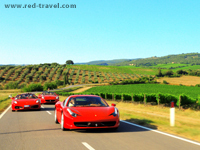 If interested in a Ferrari Tour in Italy, you can contact Red Travel directly at info@red-travel.com. Bellevy.com is the first online shop where you can buy online directly from the manufacturer at the lowest price the lastest quality products exclusively made in Italy. Bellevy.com shows up as the widest and most complete e-commerce shop to buy and sell online made in Italy products: the excellence online shop! You will be walked in the exact place where a product is born and packed, through Google map tool: this way, Bellevy.com will let you compare online features and prices about a 2007 Reserve red wine from Piedmont, Tuscany or Veneto, as well as a cashmere or silk scarf produced in the Marche, Umbria or Emilia Romagna region. From Murano glass to truffles, ceramic, there are many Italian realities of excellence to purchase online on Bellevy.com related to their place of origin. You will be able to refine your product search by selecting filters such as region, brand or price range. If you are already close o terms such as “buy online, purchase online or sell and shop online” as well as “e-commerce shopping”, Bellevy.com will make you easily find out how to match them to your favorite man or female categories: buy food online, buy wine online (oil, balsamic vinegar), buy online fashion (clothing, shoes, bags, gloves, scarves, jewelry and watches, belts, wallets), buy online beauty (perfume, makeup, treatments), buy online home accessories (furniture, lamps, bookshelves, furniture, chairs, tables, blankets, carpets). On Bellevy.com you will find the best Made in Italy brands: Murano Blown Glass, Eugenio Mombelli, Josa Pottery, Xerjoff, Arcadia, Romualdo Gherardesi 1859, Bruno Carlo, Centro Tessuti Sardi, Watches Officina del Tempo, Roberto Mantellassi, Tentazione Due, Vigneti Reale. In addition, each payment of your shopping cart online at Bellevy.com is managed by Banca Sella with the highest security standards. Europetoprent.com is our partner rental company providing the latest luxury cars, 2018 models, in any location at your choice in Europe, Germany, and other countries, but Italy, Switzerland, French Riviera. Its impressive car portfolio is composed of the new 2018 complete range of Ferrari, Lamborghini and Maserati for rent: Ferrari Portofino, new Ferrari 488 Spider twin turbo 2016, the latest convertible, Ferrari 488, Ferrari 458 Speciale, Ferrari 458 Spider, Ferrari 458 Spider, 2014 Ferrari California T, Lamborghini Aventador, Lamborghini Gallardo LP 560-4 E-Gear Spyder, new Lamborghini Huracán LP 610-4, new Maserati Ghibli, Quattroporte, Granturismo S Gran Cabrio cabriolet MC Stradale for hire, as well as the newest BMW i8 and Aston Martin DBS, delivery rent in Europe, but in Italia, Roma, Milano, Firenze, Venezia, Napoli (Rome, Milan, Florence, Venice, Naples), or Montecarlo Monaco France, French Riviera and Switzerland. Germany and other countries upon request. Enjoy your rental tour or rally with Europetoprent! If interested in a top car rental in Europe, you can contact Europe Top Rent directly at info@europetoprent.com. Our partner Air-Dynamic is offering a large fleet of VIP helicopters and Private Jets throughout Italy and the greater EU. The company provides a private and luxurious service in a time critical manner, where security is at the forefront of what they do. Air-Dynamic services are available to clients 24hrs a day, 365 days a year. 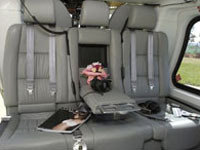 BrokerAir is a provider of private flight services. Flying with us means you are in control of how you fly, where you fly and more importantly you are in control of when you fly. You can choose the plane, the catering, the time and the destination. We will look after your safety & comfort with great discretion and efficiency. 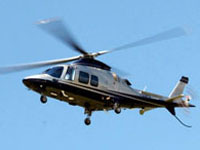 ‘Your location to Plane’: This service is provided by helicopter &/or car. 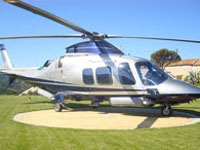 A Helicopter or a car will pick you up from your home or business location and take you to the plane. ‘Fly to Yacht or shipyard’: With this exclusive service you fly directly to your shipyard to visit your yacht. Working in collaboration with many shipyards such as Benetti, Valdettaro, Fipa Maiora, you can also use this service to inspect possible new yacht purchases. ‘Fly to Island’: This new service allows you to transfer between Tuscany & the islands of the Tuscan archipelago such as Elba and also to transfer to Sardinia and Corsica. Other Services: BrokerAir can also assist you with all the other flight services you might need both within Italy and Europe.